Motion Sensors vs Glass Break Sensors - What is the Best Security Device for my Business Alarm System? Motion Sensors vs Glass Break Sensors – What is the Best Security Device for my Business Alarm System? Often, when considering a security alarm monitoring system for your business, you are faced with competing ideas about the types of security devices which are recommended to you as part of the quote. For vulnerable areas with windows, some security companies will suggest that you install glass break sensors in those areas. Other security companies may come into your business and suggest to install motion sensors. There are several factors which go into the decision to install these devices in your building, and which will be the “best” for your business security. Before making a decision, it’s best to get an understanding of how each device works, and their strength and limitations as a security sensor. Glass break detectors do just what the name implies: they passively listen for the sound of breaking glass, and when that sound is heard put your business security alarm system into alarm, notifying your monitoring company. The biggest positive from a glass break detector is that they go into alarm while the potential intruder is still on the outside of the building. This means that when the glass is broken, the alarm will sound potentially scaring away any intruder before they even have an opportunity to gain entry to your business. This acts as a deterrent, and begins the monitoring dispatching process sooner. However, the major drawback of these sorts of devices is that they are a “one shot” device. This means that if, for whatever reason, the glass break sensor “misses” the sound of breaking glass, they are no longer an effective security tool. A glass break sensor which did not activate will allow an intruder to enter your building with no detection. As well, typical glass break sensors cover a relatively small area, typically covering approximately 25’ in either direction from the microphone on the device. A Motion Detector is a device which is installed in your facility which can detect movement when the alarm system is armed. Most installed motion sensors are “passive infrared” (PIR) detectors, which detect movement through heat signatures, however those which detect movement through other means, such as microwaves, can also be purchased. Since PIR detectors are most common, we will focus on them here. The major benefit of a motion sensor is that they are not a one shot device – they can detect motion over and over again, giving a monitoring station and police a good idea of where a person may be in your facility, and how often they’re entering an area. As we know, it is unlikely for an intruder to enter your building and not move around. As well, they tend to cover more area than a glass break sensor, with most sensors typically reaching 40 feet long and an area 30 feet wide, though you can purchase speciality detectors which can have better performance. The drawback to these sensors is that, unlike a glassbreak detector, they can only detect an intruder once they’ve gained entry to your business. This means that the person is already inside of your business before an alarm will go off. Additionally, these devices are more prone to false alarms than glass break sensors if not properly located and installed. Motion Sensors with sensitivity adjustments can be used to mitigate false alarms, however and trained installation technicians (CANASA’s ATC program, for instance) can significantly reduce false alarms from these devices. 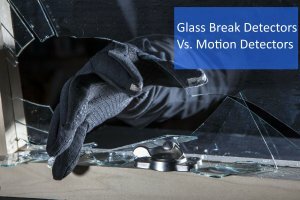 Which Device is Best for Your Business Security – Motion Sensor or Glass Break Sensor? The answer to this question isn’t an easy “A” or “B”, and what you choose depends on the risk for tolerance (and perhaps insurance requirements) or the business. As we’ve mentioned above, each device has its benefits and drawbacks which impact the device’s ability as a security device. Ideally, with an unlimited budget, you would install both devices in the vulnerable area, so that if a window is broken the alarm would go off, with a motion sensor there as “back-up” just in case. The motion sensor could also act as a second alarm for cities which require alarm signal verification prior to police dispatch, and would allow a monitoring station operator to make a better judgement on the validity of an alarm when received. The information above should help you make the best choice for you and your business’ security alarm monitoring system. As always, seek a professional, trained security alarm monitoring company who can help you find the best fit for your business. I think in installing a security system you must be able to know what kind of security system will fit in your house or business establishment.